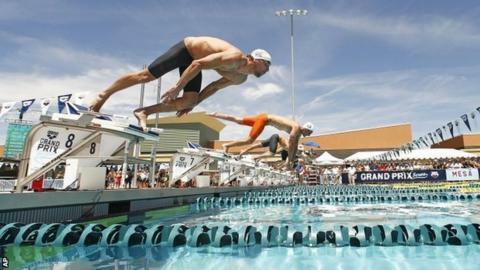 Michael Phelps rounded off his return to competitive swimming by using the 50m freestyle heats of the Arena Grand Prix to practise his butterfly. The 18-time Olympic champion opted to change strokes while his rivals swam the faster, traditional front crawl stroke at the event in Arizona. The American finished seventh in his heat, failing to qualify for the final. Earlier in the meet, Phelps was second in the 100m butterfly in his first race since coming out of retirement. The 28-year-old returned to the sport following concerns about weight gain but insisted he is a "long way" from deciding whether to continue or not. "On the whole, I think it felt pretty good," said Phelps. "I was very excited. I felt like a kid again and that was the coolest thing about it. "I was just kind of literally getting my feet wet again. This is one meet, it's one race. It's a long way from whether I decide to continue or not, but this was awesome. "I'm really excited about how things went and I do know what I need to do if I want to continue and want to swim faster, and obviously I like swimming faster and faster every race." Phelps now plans to head to high-altitude training in Colorado next month, with the US national championships to follow in August. They double as the US selection trials for next year's World Championships and will give a strong indication of his plans for the future. Phelps's coach Bob Bowman said: "Let's just see what's down the road. He has an opportunity if he wants to take advantage of it."